White Rain Lily is a member of the Lily Family. The plant grows to a height of about 8 inches and has bristly stems and narrow, glossy, dark green leaves which grow to 5 inches long. The plant is not native to the desert southwest, but is sometimes used as a landscape plant since it is drought tolerant. 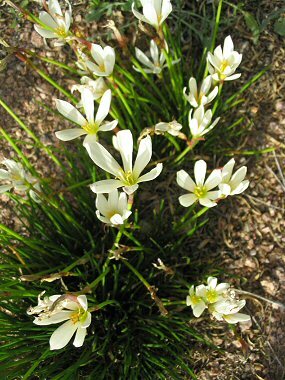 White Rain Lilies grow naturally in grasslands from North to South America. The plant blooms between late spring and fall and produces white, erect, funnel-shaped flowers with 6 petals to 2 inches wide that are rose tinged on the inside petals.